You have been tried and found guilty… of cosmetic hoarding. Admit it, you love those shiny new packages of makeup and shampoo. They lure you in and trap you. That gorgeous flat iron that you just HAD to buy is now sitting forgotten in the bottom of your vanity cabinet drawer. You can’t remember what you have and therefore continue buying, and buying. If this sounds like you, it’s time to break the cycle. Here are a few simple tips to help you on your road to recovery. They’re so easy you’ll wish you had thought of them first. If your bathroom has become a black hole, the organization process will undoubtedly take longer than an afternoon. Your children, you job, and other aspects of your life all demand your attention too. So, don’t be afraid to spread the job out over a few days, or even weeks! However, while you are cleaning out your bathroom, stop buying – you don’t need to add more stuff to the pile. No, you will never use that three-year-old tube of mascara that you found – toss it! Just like a detox of the body, this cleansing of your bathroom is a detox for your home. Throw away that old junk that you will never use again. Or, if you feel bad about throwing away something that is still useable but you don’t need, donate it to a thrift store or charity. This may also be a great time to consider ditching chemical and preservative-laden personal care products for organic or homemade varieties, which are much friendlier to your body. Overwhelmed? Of course you are. This is years of compulsive toiletry-buying in one place. Text your girlfriends, invite them to an organizing party. Maybe a few more will come if you hint that they might get free cosmetics in return. Hopefully they’ll question if you really need to keep something. It’s not always fun or easy to get rid of stuff. You’ve finally sorted through it all. Now what to do about it… the stuff that previously fit in your vanity drawers, medicine cabinet and shower shelf cannot physically be crammed back in. How it fit in the first place is a mystery of physics that may never be answered. So, it may be time to consider purchasing some alternative organization. Drawer separators are a must-have for the little things, lipstick, extra eyeshadow etc. Towel racks can free up space under the sink. A shower caddy keeps all of those hair products under control, hopefully. Use nice labels to indicate where each of your products goes. Instead of buying six shampoos at once, use the ones you have until they’re completely empty. That awesome shade of blush might have to wait a while in the store for you. Don’t worry, it’s not going anywhere. Wait to purchase anything new until you use up or get rid of something else first. 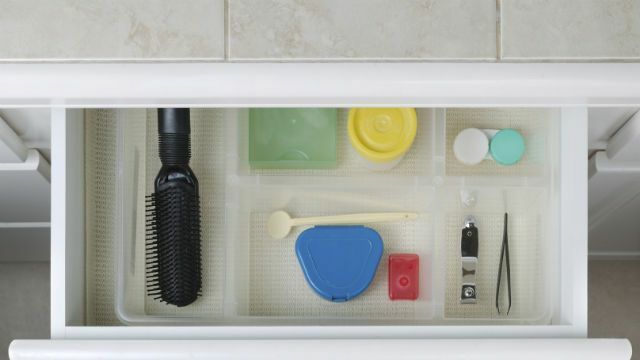 The organized bathroom life does not need to take all your time. Everything should have a home and fit neatly in that home. Good job! It doesn’t have to be torture to keep your army of cosmetics organized and clean. You’ve done a great thing, give yourself a pat on the back. Maybe buy some new organic lipstick to celebrate (just kidding)! 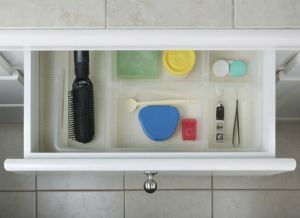 Hey Buddy!, I found this information for you: "How to Get Your Bathroom Organized". Here is the website link: https://www.thealternativedaily.com/get-bathroom-organized/. Thank you.